Next week, the U.S. Census Bureau will release its annual estimates of income, poverty, and health insurance coverage for 2016. Experts expect that these data, which reflect the final year of Barack Obama’s presidency, will likely show that middle- and working-class families continued to make modest economic gains during 2016, with moderate reductions in poverty rates, increases in wages—particularly for low-wage workers—and health insurance coverage rates that remain historically high. The new data, which follow a year of historically strong improvements on all three measures during 2015, will demonstrate the critical importance of policy choices in improving economic security as well as underscore how much is at risk under President Donald Trump’s and congressional Republicans’ budgets. As he has done in the past, President Trump may try to claim credit for progress that entirely preceded his presidency. But whether he does this or chooses to ignore the most important yearly benchmark of Americans’ economic well-being, one thing is clear: Under policies Trump has proposed—which he has largely failed to enact—struggling working families would have far fewer resources to make ends meet. Put simply, in the America President Trump wants, poverty would be much worse. New analysis by the Center for American Progress offers a glimpse into how much more severe poverty could be in Trump’s vision for America. If only three of Trump’s draconian budget cuts had been in effect in 2015—the latest year for which data are available—2.3 million more Americans would have been in poverty that year. If only three of Trump’s draconian budget cuts had been in effect in 2015, 2.3 million more Americans would have been in poverty that year. Table 1 shows those 2.3 million Americans by gender, race and ethnicity, and age. Specifically, in his budget for fiscal year 2018, Trump proposed entirely eliminating the Low Income Home Energy Assistance Program (LIHEAP), which helps 6.7 million families across the country pay their energy bills, especially in the face of extreme weather. His budget also seeks to cut an average of 29 percent of funding over the coming decade for the Supplemental Nutrition Assistance Program (SNAP), the nation’s largest nutrition assistance program. The budget also supports repealing Medicaid expansion, under which nearly 12 million Americans have gained access to critical health care services since 2014. 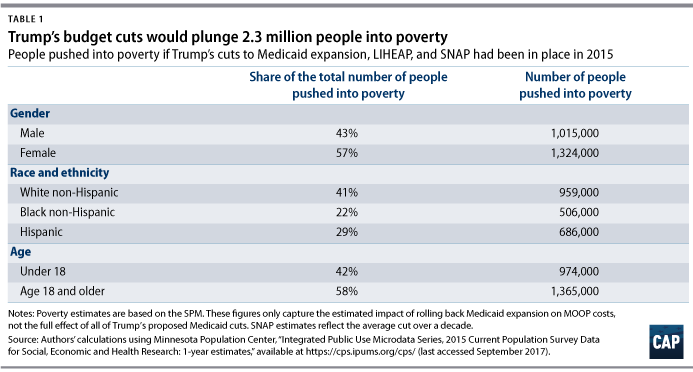 CAP estimated how increases in medical out-of-pocket (MOOP) costs due to this repeal—as well as loss of resources due to SNAP and LIHEAP cuts—would affect the number of Americans living in poverty. * While this analysis relies on 2015 data to demonstrate the effects of the cuts, we expect that an analysis based on the soon-to-be-released 2016 data would be substantially similar. The substantial increase in poverty that could result if Trump’s cuts were enacted illustrates the severe harm his policies could do to working families—but that’s just the tip of the iceberg. Among myriad other painful cuts on his budget wish list, Trump would cut Social Security, rip away services from Americans with disabilities, and slash funding for disaster and emergency relief—the very services that are critical to recovery for areas devastated by Hurricane Harvey. House Republicans followed in Trump’s footsteps with a budget that would deliver similarly punishing cuts to programs that create jobs and maintain basic living standards. And Trump and congressional Republicans would inflict all of this pain on working families for what is ultimately one simple, cruel reason: to deliver massive tax cuts to millionaires. If Trump and congressional Republicans were serious about continuing the progress toward stronger incomes and lower poverty, they could find ample examples of what works based on last year’s census data release. For example, the 2015 data showed nearly unprecedented reductions in poverty, thanks in part to a host of state and local minimum wage increases. The share of Americans with health insurance coverage jumped to historic highs, thanks to a rising number of states adopting Medicaid expansion under the Affordable Care Act. And programs that help Americans meet basic living standards, such as SNAP and LIHEAP, not only cut poverty almost in half, but evidence shows that these programs also have large positive effects on children’s long-term health, education, and economic outcomes. Instead of looking to the lessons of last year, however, Trump’s and congressional Republicans’ policies seem deliberately designed to reverse working peoples’ post-Great Recession progress—and hand these gains over to the very wealthiest Americans. Next week, when the nation receives its report card for the final pre-Trump period, lawmakers should pay attention to how much policy mattered in 2016—and remember how much is at stake in the coming year. * In fact, not only does Trump’s budget support congressional Republicans’ plan to repeal Medicaid expansion—which would cut nearly $840 billion from Medicaid over the coming decade—but Trump also calls for a further $610 billion in cuts to the program over 10 years. The overall effect of these cuts would be to shrink Medicaid nearly in half. The analysis in this column captures only the effects of Medicaid expansion repeal on MOOP costs. Taken together, however, Trump’s proposed cuts to Medicaid would likely plunge hundreds of thousands of additional people—or more—into poverty. CAP’s estimate of the number of additional people—2.3 million—who have been pushed into poverty in 2015 if three key Trump budget cuts were enacted in that year are based on analysis of 2016 March Current Population Survey (CPS) data from the U.S. Census Bureau. The authors used the Integrated Public Use Microdata Series to jointly analyze the effect on families’ income, measured using the Supplemental Poverty Measure (SPM), of three Trump budget proposals: eliminating LIHEAP, cutting SNAP benefits, and repealing Medicaid expansion. 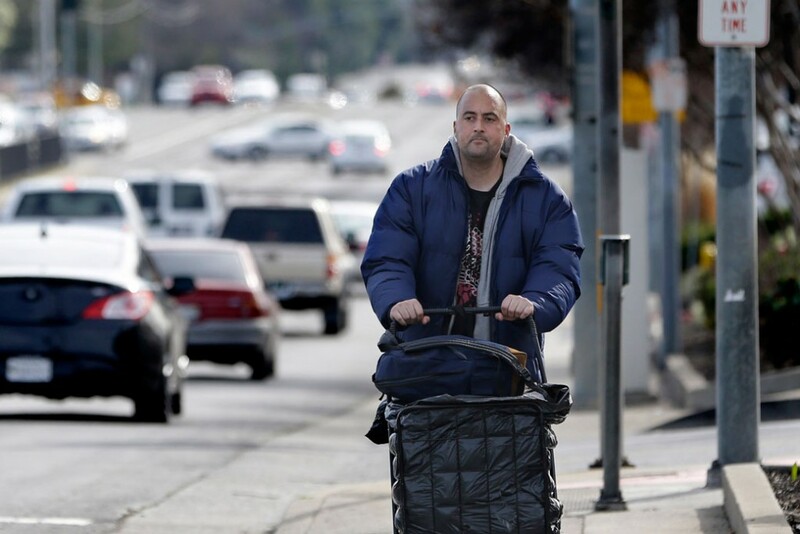 Among its other differences from the official poverty measure (OPM), the SPM accounts for income from social assistance programs, social insurance programs, and refundable tax credits—and subtracts necessary spending such as MOOP expenses. To assess the effect of eliminating LIHEAP, the authors subtracted the monetary value of LIHEAP benefits from recipient households’ total resources. To assess the effect of Trump’s SNAP cut, the authors applied the average funding cut during the 10-year budget window, or 29 percent, to each SNAP recipient household’s reported SNAP benefit amount. To roughly simulate a portion of the effect of repealing Medicaid expansion, the authors presumed that MOOP expenditures for a typical nonelderly Medicaid-eligible household in an expansion state—that is, a household with income less than or equal to 138 percent of the OPM—would rise to the level of MOOP expenses for a comparable household in a nonexpansion state. The authors compared median MOOP expenditures—expressed as a share of total household SPM—in states that expanded Medicaid before 2015, which corresponds to the year of CPS data used in this calculation, to that in states that had not expanded Medicaid. The sample was trimmed to exclude households for which reported MOOP expenditures were negative, households for which MOOP expenditures exceeded 500 percent of annual household income, and individuals age 65 and older—whose households’ MOOP costs are assumed to be largely unaffected by Medicaid expansion. The authors assumed MOOP costs would increase by the obtained percentage of household income, as defined by the SPM, for all Medicaid-eligible households in expansion states. This approach does not capture behavioral effects—such as the impact on individuals’ health care spending of gaining or losing access to health insurance—on poverty. However, it likely represents a conservative estimate of the effect of Trump’s proposed Medicaid cuts for several reasons. First, health insurance coverage protects against catastrophic medical expenditures—which for some households could exceed 500 percent of annual household income. Second, as noted elsewhere, repeal of Medicaid expansion represents less than 60 percent of Trump’s total cut to Medicaid. Finally, stripping health insurance from 12 million newly eligible Medicaid recipients—who tend to be healthier and less costly to cover than non-newly eligible recipients—would increase providers’ costs of uncompensated care, driving up costs for all health care consumers. Since some households would be affected by more than one of the budget cut proposals, the authors simulated the effect of applying all three of these cuts simultaneously on the number of households with an income less than the SPM poverty threshold. Rachel West is an associate director for the Poverty to Prosperity Program at the Center for American Progress. Katherine Gallagher Robbins is the director of family policy for the Poverty to Prosperity Program at the Center.